Tigerdoe Fake Beards for Adults Kids - 4 Color Pack - Costume Accessories - Beard & Mustache | What Should I Say? 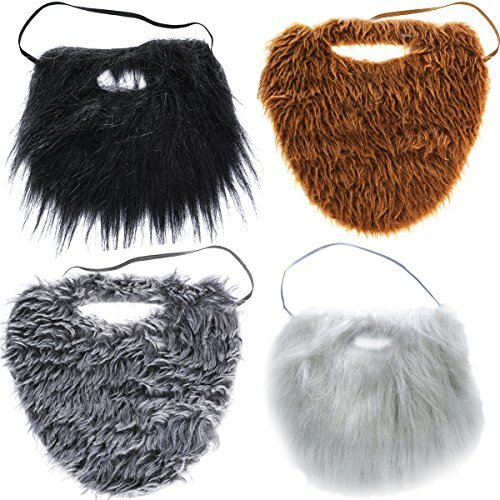 Fake Beards for Adults or Kids - 4 Color Pack - Halloween Costume Accessories - Beard & Mustache. The Best Beard Set You Have Seen, 4 Beards in one Pack! Great Quality Costume Accessories for Halloween, Family Parties, and Office Celebrations. The Best Beard Set You Have Seen! Four Beards in One Pack, Excellent for Adults and Kids Alike! 1 Black , 1 Brown , 1 Grey, 1 White Beard Included to Match all Your Costume Accessory Needs. Beards are Neatly Trimmed with a Connected Mustache and are Made of Synthetic Fiber. Comfortable and Easy to Wear! The Beards Attach with Elastic Around the Head. Great Quality Costume Accessories for Halloween, Family Parties, and Office Celebrations. If you have any questions about this product by Tigerdoe, contact us by completing and submitting the form below. If you are looking for a specif part number, please include it with your message.